Interesting restaurant concept. Select ingredients and they build your burrito right in front of you. Nothing bad about the restaurant, I just didn't like the menu choices and concept. One thing to remember, food portions are huge. I visited after lunch hour and maybe food was still left from that time. It was OK but not as fresh as I would like, Reminds me of Moes....Jr. If you have a taste for Mexican food this is adequate. Really liked this little place. Food was fresh and flavorful. Each dish comes with a handful of chips and for an extra $1 you can get queso or guacamole or salsa. 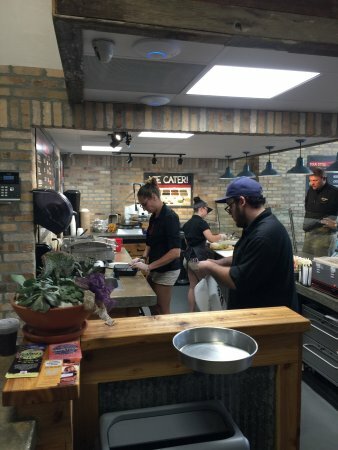 It's basically Chipotle, which is not a bad thing because there are no Chipotles in the downtown area and the closest one is at least 20-30 minutes away. 3 Peppers but 5 stars! The food is a bit pricey but large portions. If you have eaten at a Chipolttee or Qdoba or similar resturant, you will not be disappointed. Tacos, Burrittos, Bowls and Quesadillas.